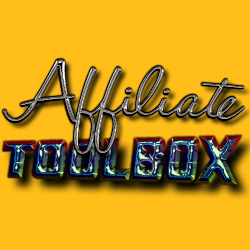 Free Website Traffic And More! Treasure Hunting Traffic - Proactively Bringing Quality And Targeted Traffic To Your Websites, Affiliate Programs, And Blogs Through Free And Low-Cost Membership Packages. All new members will get $1.00 added to their account, 500 site credits plus 500 banner impressions, and 500 text ad impressions after surfing 250 sites. No worries if you can't surf it all in one day; our system will keep track for you. 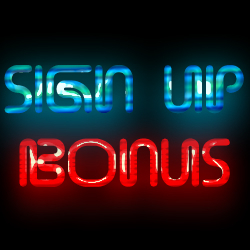 Once you have surfed 250 sites the bonus will automatically be added to your account. When you surf 100, 250, 500, and 1000 pages a badge will appear in the surfbar. Click on the badge and enter your username to collect the cash. If you are not a member of TE Promos, click on the image above or the button below to join TE Promos and start earning cash for your surfing! Click Here To Join TE Promos!. 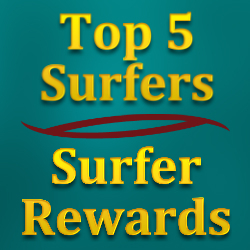 Top 5 Surfers: Win cash and other prizes by being one of the top 5 surfers of the day. View your placement in the top 5 in real time as you surf. Surfer Rewards: When you are finished surfing for the day visit the "Surfer Rewards" page and pick a prize. The more you surf, the better the prizes. More! : Bonus and prize pages, Word Search, Hangman, and more! You can earn cash and credits by promoting Treasure Hunting Traffic with your referral link in emails, link exchanges, other traffic exchanges, Facebook, Twitter, Google+, etc. There are several banners and splash pages as well with your referral link attached. If any of your referrals purchase and upgraded membership or credit package you get a commission on the sale! Click Here To Join Treasure Hunting Traffic! 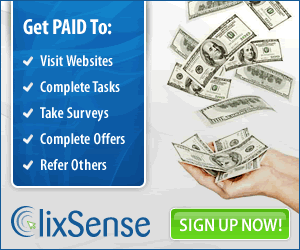 Clixsense has been around since 2007, and is one of the top PTC sites on the Internet. Earn cash for every click. For more information, or to sign up, click the banner above. These are other sites that we own. Click on the banners to visit the sites.